Proposals for new projects arrive on city desks everyday showing vibrant public plazas full of people. But too often those spaces fail to attract people in the way they were portrayed. Are Photoshopped people a deliberate falsehood? Children run playfully about, chasing pigeons. A jogger passes by, and a businesswoman chats on a cell phone. Seniors perch on the edge of a fountain, watching the throngs of people as they pass. In fact, there are masses of people keeping these folks company, filling an imaginary public space like a dance troupe on a stage. So it goes in the world of architectural renderings and development proposals, where the desire to show that public spaces can become vibrant and active results in a flurry of Photoshopped humans filling the frame. 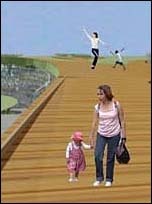 But are these people a true indication of how a public space will be used, or are they a sort of architectural cheat? "It can be a mistake for designers to overplay the number of people," says Brent Toderian, planning director of the city of Vancouver, B.C. "Because all they've done is spark the discussion on what's missing in the design. Are we kidding ourselves? Are people actually going to be using the space in the way they do in the illustration? We who are in the business of reviewing designs, commissioning designs, take them with a grain of salt." But, Toderian notes, cities with less rigorous planning processes could be fooled. Architectural renderings are used primarily by practices seeking to entice customers into purchasing, or investing in their designs. Portraying citizens using and appreciating the spaces is usually central to adding value and marketability to a design or master plan, so they are a common tool for sprucing up a proposal. "Are they dishonest? I think they're wishful thinking," says Toderian. "They're the architectural equivalent of the McDonald's hamburger looking much better in the picture than it does in real life." Fred Kent, founder and president of the Project for Public Spaces, says the real problem is that the people designing public spaces are often design-driven rather than people-driven. "You can always see if a design firm knows how people really use spaces.," says Fred. "When you show a picture of people doing something real, people react. 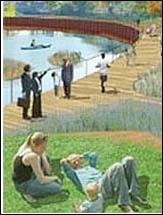 Those renderings often don't reflect any emotion, the people are never doing anything natural. They're placeless, senseless and soulless." Kent places the blame on the spread of computer-aided design. The last decade has seen the use of Photoshop and 3D visualizations increase exponentially to create renderings that are full of photographs of people in the midst of their daily life, but chopped out of the original setting and pasted into a new one. "There's a lot of voodooism going on," Says Kent. "Computer design has taken the humanity out of design." "People usually look at eyes first for emotions such as anger, and this can draw attention away from the architecture in the rendering." Tomasz Biernacki, of Pechara Studio in Napa, California explains. Biernacki struggles with including people in his proposals, but ultimately he believes they are necessary to show scale. One way he avoids the distraction factor is to use images of people with their back turned to the camera or blurring them, thereby reducing the attraction to the eye. 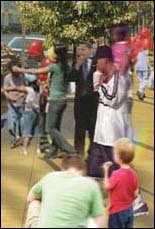 He also uses images of people that are walking around naturally, instead of "using their cell phones like mannequins." Kent agrees that natural-looking behavior is key. He likes to tell the story of when Robert Redford saw a film created by Kent and his mentor William H. Whyte back in 1980. Whyte secretly filmed New Yorkers as they went about their business in public spaces to see how they actually use their built environment. Redford was amazed. Kent says, "He told me, 'When I saw that movie, I got a whole new sense of what real activities are, all the natural things that people do that are spontaneous.'" That sort of spontaneity is rare in design proposals, says Kent. "The talent of the illustrator can also be greater than the talent of the architect," adds Toderian, suggesting that beautiful renderings can also be poor representations of the resulting built environment. But ultimately he believes that the trained eye will see through these tricks and understand innately where the problems are. "Are there the attractions? Are there the uses? Are there the edge conditions and activators?" asks Toderian when looking over a new proposal. "Is there design that will make it likely that people will come in the way that the illustration suggests?' And if not, that's a great point of discussion."